Many of us are craving fall flavors these days, and this recipe for Pumpkin Chocolate Chip Cookies fulfills that craving while keeping the process ultra simple by using premade cookie mix. 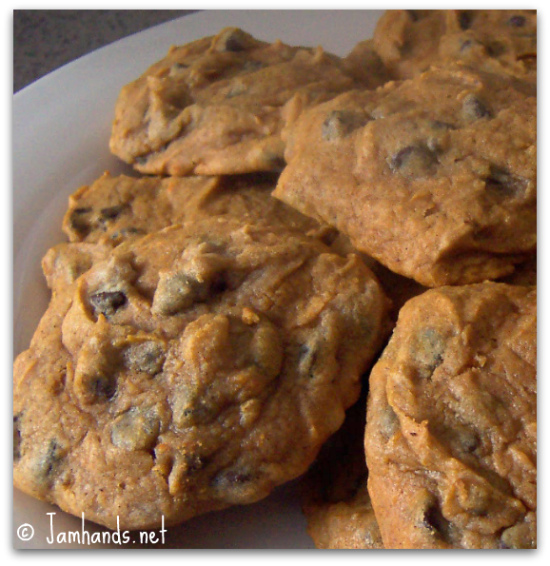 The result is a cakey, or puffy textured chocolate chip cookie with a comforting pumpkin flavor. 1. Add all ingredients to a large Ziploc bag. Squish until combined. Cut off a corner of the bag and squeeze out dollops of dough onto cookie sheet, spacing them two inches apart. Bake at 350-F degrees for 15 to 20 minutes. I'm a sucker for pumpkin recipes! Yum, I'll have to give this a go. I like the plastic bag method. But now I'm sad that I'm at work and can't make these immediately. Hey there...just saw your comment inquiring where I got the play food from in one of my posts. The wooden food is from Melissa and Doug. You can find them on Ebay for much cheaper than in stores. Love pumpkin and chocolate anything! this looks delicious!